I did struggle a little bit with calling the last two programs “games” yesterday, and that’s because I have another list of legitimate games to cover. So here’s a strong start for a run of games: scrap. 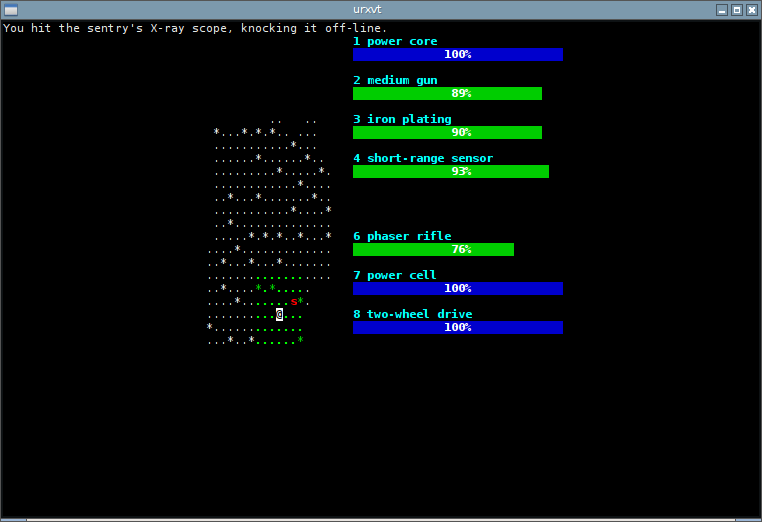 scrap doesn’t look like much, and if not for the description I linked to above, it might go unnoticed somewhere in the throng of roguelikes in the world. It even seems to have lost its home page, although a copy exists on the almighty archive.org. scrap, on the other hand, does bring something new to the game. The premise is that you control an armed robot exploring and evading mechanized enemies that are hell-bent on destroying you. Survive and explore, through 20 levels with stairs between maps. But scrap wins big points from me for a very simple game mechanic that makes it terribly enjoyable. Your robot comes with some fundamental equipment, and has space for a little more — up to eight “slots,” so to speak. As you encounter robots, you have the option to scavenge their equipment to replace or enhance your own. At its purest, it’s not a new principle. After all, everything from rogue on down through the genius of Cataclysm: DDA and Dungeon Crawl: Stone Soup follows the idea of swiping equipment off defeated monsters. But scrap keeps your inventory simple, limits you to eight items — some of which are quite important, like a form of locomotion — and exposes you to the risk of losing those components, should the battle turn against you and something is destroyed. You’ll need to know which tools are worthy of replacing, and what features they offer. And perhaps more importantly, which can be safely discarded — and when. If you ever played a mid-1980s Lucasfilm game called “Koronis Rift,” scrap will be a delightfully nostalgic (albeit text-based) romp. It’s true, Koronis Rift was slightly different in its approach and added the prospect of scavenging technology for money, but it was also very, very linear, which sapped its entertainment value, after a point. I haven’t found scrap in any distro yet, which may mean it’s a free-ranging program, but also might mean it’s hard to find among all the “scrapers” and “scrapys” that clutter my search efforts. If you’d like to package a game that’s good fun and not likely to take up too much of your time with updates 🙄 here’s a winner for you. This entry was posted in Linux and tagged game on 2015/03/10 by K.Mandla. Any tips on how to install/compile this on linux? The site on archive.org only has a Windows binary and a source .tar.gz. Unpacking the source archive I saw a file `makefile.linux` and tried running `make -f makefile.linux` but ended up getting a bunch of errors.